Lady Gage has been on fire lately; nothing like an Oscars performance and a surprise engagement to start your February off right. 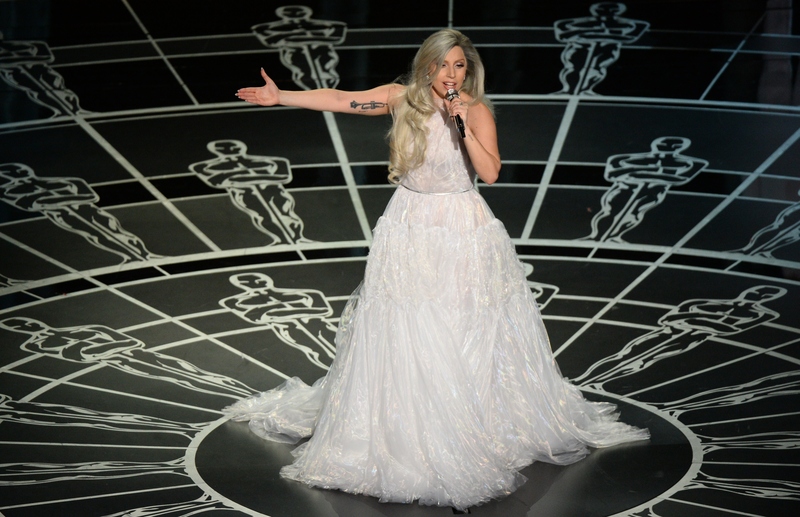 We didn't know much about the Lady Gaga performance going into tonight's 87th Academy Awards, but we did know one thing: it was a tribute. But to what, or whom? Lady Gaga surprised us all with her stunning homage to The Sound of Music in celebration of the film's 50th anniversary. The Oscars are a glamorous night in Hollywood and even the rebellious Gaga glammed it up for the Academy, both on and off stage. The usually bizarre Gaga downplayed her — shall we say — eccentricity for her tribute to The Sound of Music, wearing a stunning white gown (no coincidence with that new rock on her finger, I'm sure) that complemented her killer hair and makeup. No one could ever live up to Julie Andrews, but Lady Gaga came close with an incredible medley of "The Sound of Music," "Edelweiss," and "My Favorite Things," proving that she can really sing and also that she can pull off "normal" surprisingly well. Her star-studded audience was clearly enjoying the performance, especially her von Trapp predecessor, Julie Andrews, who offered Gaga a warm embrace after the performance was over. After the epic "Everything Is Awesome" performance from Tegan and Sara and The Lonely Island, and the moving John Legend and Common's performance of "Glory," Gaga had some big shoes to fill — and she somehow still managed to wow us with a few of her favorite things. The hills were alive tonight with the sound of Gaga's music and, if you missed it, Gaga's tribute performance should be on the top of your must-see list.